The main gate of Sheikh Safi al-Din Ardabili's Mausoleum which was constructed during the Safavid era was unearthed completely by archeologists. Tehran, 27 July 2006 (CHN) -- The first season of archeological excavations in the vicinity of the domed mausoleum of Sheikh Safi al-Din Ardabili in the city of Ardabil resulted in discovery of some architectural remains belonging to the Safavid dynastic era (1502-1736 AD). Unearthing the Ali Qapu gate, which is the mausoleum's main gate, in this historical domed monument was a major achievement during this season of excavations in Ardabil. Remains of the famous kitchen of Sheikh Safi were also discovered by archeologists. Prior to this, development constructions in the vicinity of Sheikh Safi-al Din Ardabili's domed mausoleum led to destruction of a great part of the Ali Qapu gate, which made archeologists decide to take out the gate entirely to prevent further damages. "Among the architectural remains found in this area, which had previously been excavated in 1995, is part of the original wall of this monument which was constructed with rubble and brick. The new wall was later constructed on the old one which separated the building from the street," said Hassan Yousefi, head of excavation team in Sheikh Safi-al Din Ardabili Mausoleum. After finishing the excavations, the place was covered with soil and brick to protect the remaining evidence which may still be left in the area. Archeologists are hoping to find the main architectural plan of this Islamic monument during their future excavations. Sheikh Safi al-Din Ardabili (1252-1334 AD) was the spiritual heir and son in law of the great Sufi Musshid Sheikh Zahed Gilani. Sheikh Safi was a Sufi and poet; however only a few verses of him called Dobaytis (double verses), which were written in old Tati and Persian, have been remained which have linguistic importance today. 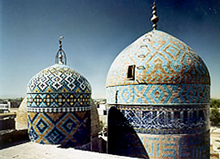 Sheikh Safi al-Din Ardabili Mausoleum is one of the historical and tourism attractions of the city of Ardabil. This historical complex has a close relation with the history of the Safavid dynasty. Some Safavid kings have been buried in this place. The main section of the mausoleum is composed of a circular tower with circumference of 22 meters which is about 17 meters high. In the interior of this monument, near Sheikh Safi's, the tomb of his son who laid the foundations of this mausoleum after his father's death to keep alive his memory, as well as those of other family members can be found. Main parts of the complex include the gate, the large court, the small court, the graveyard, Shahidgah (martyrdom place), Jana Sara Mosque and Chelleh Khaneh which encircles Ghandil Khaneh, Haramkhaneh (the harem), and Chini Khaneh. The Allah Allah Dome is very famous and probably the most spectacular part of the complex.